Before you start sweating at the mention of “Christmas”, hear me out! I’m not decking the halls just yet (and I won’t be for a while, rest assured 😉 ). But, I have been having a little fun with Christmas in July over on Instagram (follow me HERE), asking people to share their photos with #KNChristmasInJuly; I’m sharing a few favorites in my stories all month long. It’s around this time of year I’m finally over last year’s Christmas chaos and can start to look forward to the excitement of the coming year- come July, I’m missing the magic. 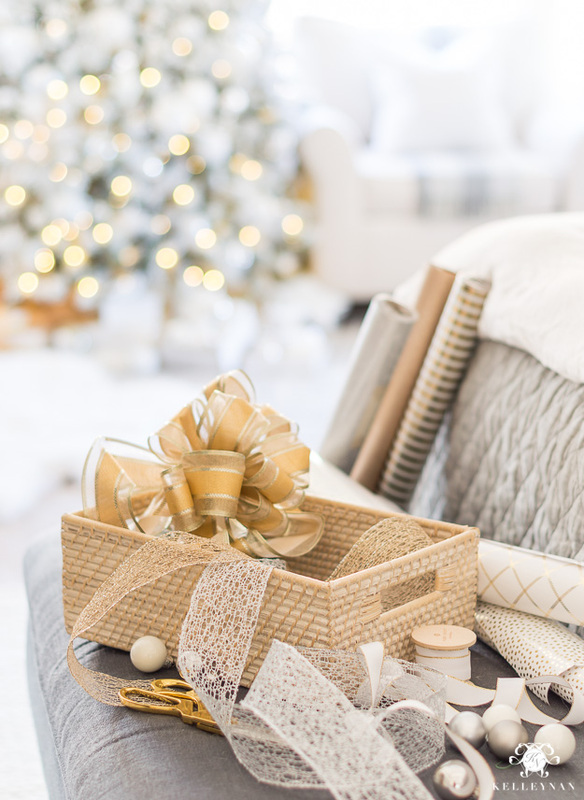 I think it’s important to appreciate each season but I don’t think there’s anything wrong with looking forward to the spirit of the holidays – or preparing for them – like… starting your Christmas list and coming up with Christmas gift ideas. Family trips as Christmas gifts are becoming more common as a lot of people are leaning more towards filling their lives with experiences and placing less emphasis on things. If you are planning a getaway for your family, have family traveling in to spend the holidays, or maybe just have someone(s) on your list who travels a lot, these are some great go-to ideas – either on their own or coupled together. 1. Packing Cubes // These are on my own personal list after seeing how successful others have been in not only better organizing their their suitcases, but also in saving space. Far too often, I check into my hotel, in a hurry to get to whatever commitment I have planned, throw open the suitcase and start digging aimlessly. These would help a ton. 2. Neck Pillow // I haven’t jumped on the neck pillow train just yet but Dave can’t live without his. Not only does he use his for travel (on planes and in the car), but keeps his in his car for impromptu, quick naps. (Don’t tell him I said that haha). This one is on sale and is filled with lavendar for extra relaxation and claimed healing – you can even microwave or chill the insert! It’s $13 off right now. 3. Monogram Passport Holder // Right now is the perfect time to secure anything monogrammed – once the season gets closer, you may find yourself in “do I have time to do that? !” mode so go ahead and make a list of anything you need customized now. This sleek passport holder comes in several colors. 4. Monogram Luggage Tag // Like the passport holder, this luggage tag comes in several colors and takes a basic gift to something thoughtful and special. 5. Electronic Accessories/Cord Organizer Roll // I have a zipper pouch that holds all our cords when we travel and it just doesn’t cut it. All the wires jumble and tangle together and create a big mess (which I hate when I’m trying to consolidate/access on a plane or in the airport, especially). This little roll comes in several colors, can also be monogrammed, and can roll as tightly as your organized cords allow. 6. Air Pods // We do not have these and instead have to carry around a mess of cords. The worst is taking my dogs on walks or carrying several shoulder bags that inevitably rip the headphone cords out of my ears. These are on my personal list, too. 7. Jewelry Organizer // I have so many friends who still carry plastic baggies as their jewelry holders when they travel. Even my cinch-able pouch has resulted in tangled messes and broken jewels. This one is compact and keeps everything compartmentalized and organized – plus, it’s on sale for almost $25 off right now! 8. Portable Phone Charger // Also on my own list I find myself with zero cell phone juice almost on a daily basis. I love my car but my biggest complaint is that it charges my phone at a snail’s pace. And, if I’m using maps or talking on it, it does well to even hold me at the percentage I was at previously while plugged in. This portable phone charge is small and compact, comes in several colors, and I think is going to be a quickly realized purse necessity. 9. Barefoot Dreams Hooded Cozy Cardigan // I actually have this highly rated, buzzed about cozy Barefoot Dreams cardigan on the way for myself and I can’t wait to see if I’m on board with all the hype! 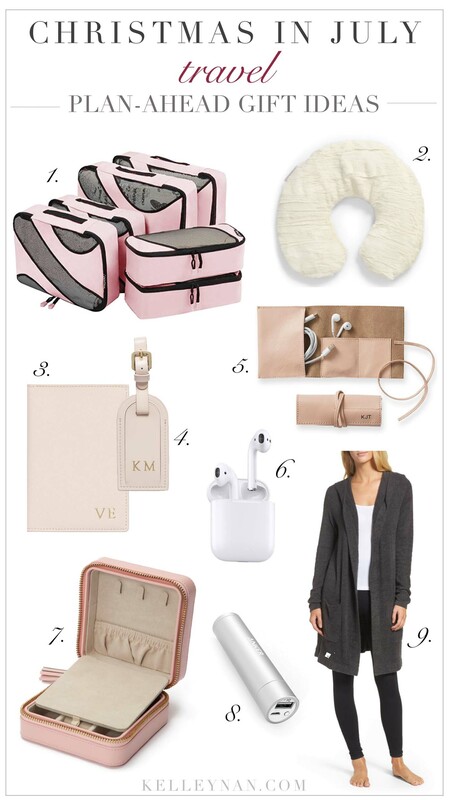 I always travel comfortably and I’m hoping this throw-on will be the perfect car and flight companion. It’s normally $114 but right now, is on sale for $75.90. These are perfect go-tos for just about anyone- I have given/received most of them myself ; ) Plus, a lot of them can be scooped up at a killer price right now. 1. Instant Pot //I went crazy last year and grabbed up several as gifts, plus asked Dave to get one for me (he did 😉 ). Since then, I’ve become an Instant Pot addict. If you aren’t familiar, it’s a multi-function cooker from pressure cooking to slow cooking, sautéing, rice cooking, steaming, etc. I’m still finding my way around it but everything I’ve tried has come out phenomenal. It’s the only way I will fix brown rice now, too. Plus, I’ve successfully been able to adapt several oven recipes to one-pot, quick dinners. Basically, you can throw in frozen chicken with rice, veggies, etc. and after the pot gets to pressure, have it cook for 23 minutes, natural time release for 10 minutes before quick releasing the rest of the steam, and have a totally cooked dinner with chicken so tender, it is shreddable. Mothers, bachelors, bachelorettes, couples, or children just starting out- this is a gift that will be used over and over again. UPDATE: THIS ONE is a 7 in 1 that is on sale for PRIME DAY for over 40% off for under $59! INSANE! 2. Grilling Tools // My favorite way to gift these is with a couple of freshly cut and wrapped steaks from the meat market… maybe even with a special rub. If you order some sets now (dads, brothers, etc. ), all you’ll have to worry about during the holidays is to head to your butcher for some special cuts. These are on MEGA sale for $18.99, marked down from almost $40. 3. Stand Up Log Carrier // This is on my list to get for Dave. He has been using a thin-handled basket (not meant for carrying heavy logs) for the past few years and each time he brings it in from the garage, I just know it’s going to break. A lot of log carriers don’t have sides or collapse which can get super messy. This one though- it stands up and has sides to contain the mess. This is also monogramable (which is the perfect reason to go ahead and order for your husband, dad, etc.). It comes in a few colors and is under $40. 4. Home Tool Set // Dave gave me a full tool set for my birthday and it is actually one of my favorite gifts he’s ever given me. I am always needing screwdrivers, levels, hammers, etc. and he and his tools aren’t the most organized to sift through. He agreed my set would solely be MY SET which I keep in the office. It has been perfect. This is perfect for anyone but especially someone who is just recently on their own. Plus, it is 50% off right now and on sale for only $29.99! 5. Ring Door Bell // We still have a video doorbell on our personal list but over the next two days, the Ring is $75 off. This is great for parents or husbands and I can’t wait until Dave surprises me with installing one so I can stop hiding every time the doorbell rings! 6. Echo Dot // We now have two full Amazon Echos (on sale right now for $30 off! HERE) and two dots – we keep one Echo in the kitchen, one outside, one dot in the bedroom, and one in my office. The Dots are basically just smaller Echos with smaller speakers (on sale for $29.99 for PRIME DAY! HERE). We do everything from listen to music to ask the weather to ask general questions. I set kitchen timers, getting ready timers, and morning alarms. We even use it to play rain sounds while we sleep (they come with a ton of sleep sounds you can program). This only scratches the surface of their capabilities because they now have compatible outlets, lights, etc. that are all voice controlled through the Echo. If you don’t have any or need a few more for around the house, PRIME time is when to get them! 7. Amazon Fire Stick // We recently did away with cable and rely solely on Hulu Live, Amazon Prime, and Netflix for our tv watching – we don’t miss it a single bit and we do it all through Firesticks, plugged into all our tvs (it has all the apps and subscriptions services contained). Our latest versions even have voice command. They are 50% off right now for PRIME Day and can be scooped up for $19.99 each. 1. Kate SpadeCard Holder Wallet // I love the idea of using a wallet as a gift card holder- especially if you don’t want to get a bunch of random stuff that may or may not be used. Slide one inside (for gas/dinner/etc.) or fill it up and give as an all-in-one gift. This Kate Spade comes in a few colors and is on sale for $51.90 right now! 2. Tory Burch Mini Wallet // Same idea as above, this Tory Burch mini wallet comes in a few colors and is on sale for 38% off! 4. Gold Twig Cheese Knives // These are on sale right now for $18.90 (originally $29); I love the idea (and have shared it many time) to pair a set of cheese knives with a board, some blocks of cheese, preserves, wine… you decide how elaborate you want to make it! These are great gifts to grab on sale and keep in your gift closet too. Even if you give without a board, you can always take the knives with cheese as a hostess gift. 5. 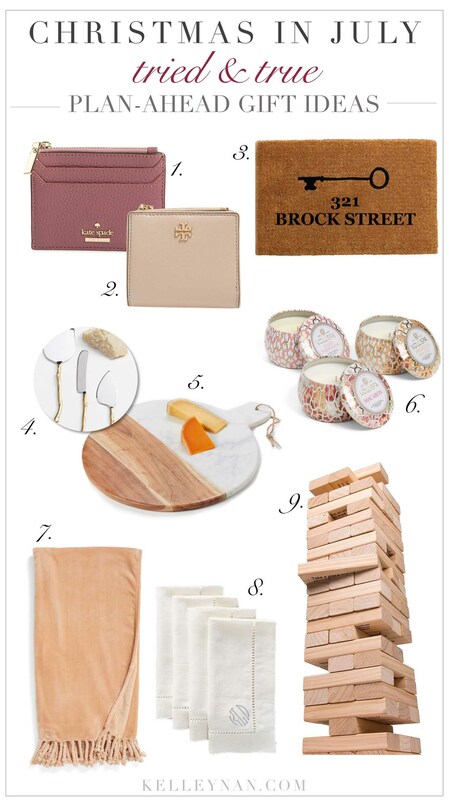 Marble & Wood Cheese Board // See above for gifting idea; this two-toned board is normally $75 but is on sale for $49.90 right now. 6. Candle Set // Another perfect gift to stock up on for your gift/hostess arsenal, these candles sell out every year during the Nordstrom Anniversary Sale and have insanely high reviews. The full set is $15.90 (marked down from $24) which comes out to about $5/candle if you split them up for favors/hostess gifts. 7. Plush Tasseled Throw Blanket // I personally have one of these (in cream) and just ordered a second (in navy). It is the softest throw I’ve ever had and the fact that it’s on sale for $25 right now is pure insanity. I especially like the idea of pairing these with a few inexpensive snacks/candies, hot chocolate mix, etc. for a cozy night around the fire during the holidays. 8. Monogram Linen Napkins // This is a thoughtful gift anyone would appreciate – especially a couple who only recently started sharing the same last name. These come in several color and monogram style but remember – if you go for the 3 letters, use the wife’s initial first, then the last name initial, then the husband’s first initial last. This is a thoughtful gift that will be used and treasured forever. 9. Jumbo Jenga Drinking Game // Ok, so remember when Dave and I were playing this which resulted in a busted mirror-top coffee table on NYE? Well, we may have cursed it that night but we still love the game. I just found this version which has turned it into a drinking game with actions on the bottom of each block that is drawn! You can visit the link for a close up for some of the examples. This is fun, especially for those who like to entertain. The Nordstrom Anniversary Sale is going on now (cardholders only until this Friday); see everything I’ve ordered and am awaiting HERE. Also, today marks the start of Amazon PRIME DAY! Most deals included (exclusive to PRIME members) are better than Black Friday. You can shop the full sale for the next day and a half HERE. A lot of items will run out and once they are gone, they won’t be re-stocked at the sale price. This one is best to shop early and often. This is a fabulous idea! What a smart way to take advantage of those summer sales and take away the angst of the holiday season! Thanks! Great ideas! I like to keep volcano candles by Capri blue on hand to give as gifts because the scent is so great and one I think almost anyone would enjoy burning in their home. I’m also really interested in the instant pot after reading about all it can do! Olivia! That is perfect and what an AWESOME friend you are- I would be ecstatic! 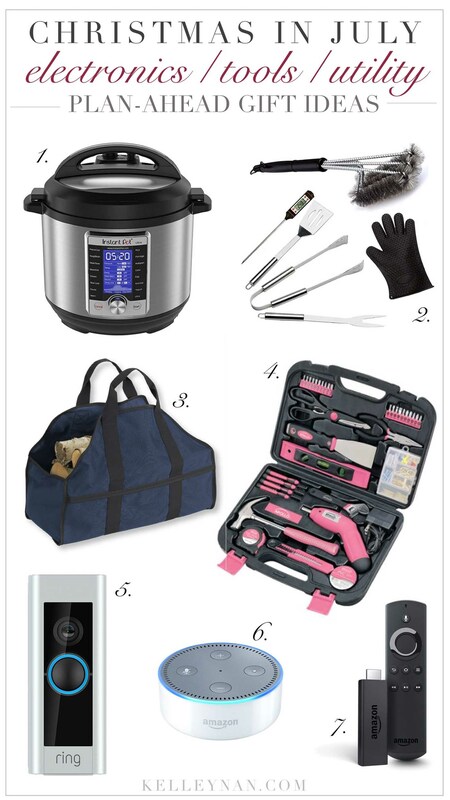 (Those are my FAV) And yes- the Instant Pot is incredible! I love you more than ANY OTHER BLOGGER! I check this every single day and you always respond so thoughtfully. I think I asked you a week ago about your hubby’s favorite cologne so I could get a head start on buying gifts for my 18-year-old TEENS! But this! Wow! This helps me so much on my teacher budget and I absolutely appreciate it! So grateful. Don’t ever question how awesome you are! You help so many people who don’t have the time to comment. I know. I rarely comment on blogs and I need them!